Experts agree the means-tested system of social care needs to change - they just cannot decide how. With an ageing population set to heap even more pressure on services, the government in England is poised to act. There is no simple definition of social care. However, it is agreed it covers a wide range of services provided by local authorities and the independent sector to elderly people either in their own homes or in a care home. It also covers day centres which help people with daily living. Services like help with washing, dressing, feeding or assistance in going to the toilet are also included, as are meals-on-wheels and home-help for people with disabilities. Currently, anyone with assets over £22,250, including property, has to pay for their own social care whether they live in a nursing home, their own home or warden-controlled sheltered housing. Anyone found by means-testing to be under that threshold has their care paid for by the state - or if they are close to the threshold get some contribution towards their care. The only exception is if the need for help is linked to a specific medical condition when their care is then defined as an NHS service and therefore provided free. But patients groups report that many people actually struggle to get health chiefs to recognise their need as health-related. Why does the system need to change? According to a recent report by Sir Derek Wanless, who has acted as a government adviser, there are "significant shortfalls" in what the present system provides. Some of this is because services are poorly delivered, but it is also because of limited funding and resources. Community-based services are scarce, so there has been a tendency to provide services in a care-home setting. But most older people prefer to receive care in or close to their homes, and the report claims it is better for them in the long-run. In addition, watchdogs have warned that councils are tightening their budgets, targeting those with the highest level of need so people with moderate levels of need have lost out. What's the problem with means-testing? The concern is that the system is unfair because even modest savers are penalised by being made to cover all their care costs without state support. Since the cost of care is high and the threshold for state assistance low - and because most elderly people do not have high regular incomes - many thousands of people have been forced to sell their homes to pay for their care. The government agrees there is a problem and has said tackling the issue will be a key challenge for its forthcoming spending review. Has it been looked at before? 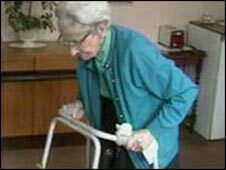 In 1999 the government commissioned a review of how to fund long-term care for the elderly through a Royal Commission headed by Sir Stewart Sutherland. The Royal Commission on Long-Term Care examined short- and long-term options for funding long-term care. It made 24 recommendations, including one that personal care should be free, but this was rejected by the Westminster government. Unlike ministers in England, their Scottish counterparts acted on the Royal Commission's recommendations. In 2002, a policy was introduced to allow people free personal and nursing care. Scotland is the only nation in the UK to have done this with Northern Ireland and Wales still having the means-tested system that England has. However, the Scottish system has still come under attack. In February, the spending watchdog Audit Scotland said access to free care varied from area to area as councils were using different eligibility criteria. In Scotland, people living in care homes still have to pay for the accommodation costs. The government in England is launching a consultation on social care which will then help form official policy later. It comes amid a debate about the merits of a top-up system of funding. Wanless called for all those in need to be provided with a basic guaranteed minimum level of care for free. But he said individuals should then be free to top-up their care packages themselves with the state matching the payments up to a set point. Those deemed unable to afford to pay the final portion would be eligible for benefits to fund their extra contributions. But some have claimed this will benefit the well-off the most.